the wiki that anyone can edit. On the BattleTech Forum, author and ex-Line Developer Herbert A. Beas has begun publishing the hitherto unpublished third part of the Forgotten Worlds serial, titled "Escape from Jardine". Mind that, at this point, the publication is inofficial and thus technically amounts to fan fiction. Two short stories from the Legacy anthology, Swords of Light and Darkness and End of the Road, have been nominated by the International Association of Media Tie-in Writers for their 2019 Scribe Award. The BattleTechWiki Founders Awards give recognition to all of the amazing community members and their contributions over the last year. Please cast your vote for your the community members you think made the biggest impact for the 2018 Founders Awards. Sarna.net BTW broke a record this past year, with 3770 new articles created! And there's yet more cool new stuff on the horizon. This is definitely a good time to be a BattleTech fan. ;) May our great community grow even larger in the new year. Following the sometimes intense and passionate discussions on the BattleTech Forum (and elsewhere) about the BattleTech computer game by Harebrained Schemes and its adherence to established BattleTech canon, HBS and Catalyst Game Labs dropped something of a bombshell by announcing House Arano (The Aurigan Coalition) as an upcoming product. Fully canonical, it is to be set right after the conclusion of the Arano Restoration storyline from the game, and is expected to canonize most if not all of the new content created by HBS for their game including the Aurigan Reach periphery region and its history. Our Policy:Notability has been revised, and was substantially altered in the process by User Consensus. We now positively embrace Stub articles as preferrable over summary list articles going forward. A related but separate result is that we chose to abandon the concept of "minor" for categories and other articles, because it is deemed too subjective, impossible to properly define, and ultimately unhelpful. Avoid this word. We've added a new ad slot in the right column for Community Ads. 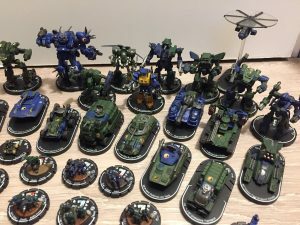 If you have a BattleTech-related project that you'd like to get some free advertising for, please check out the Community Ads section. This page was last edited on 1 January 2019, at 04:38.